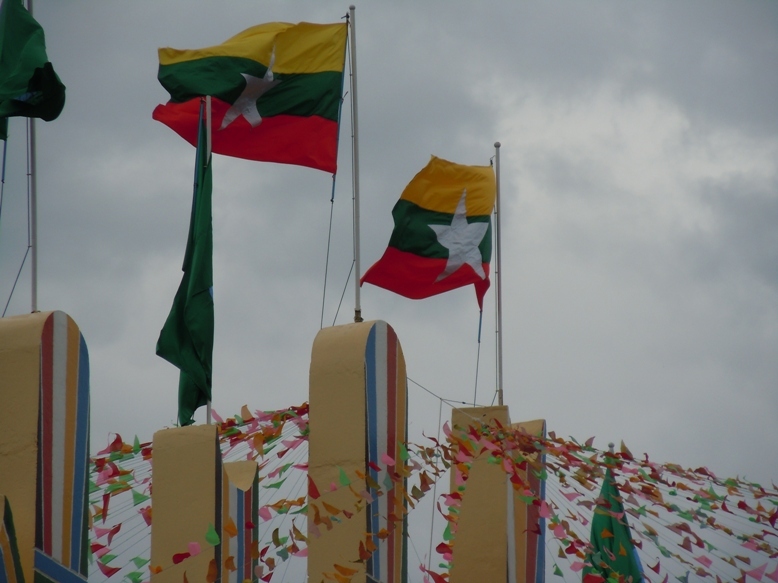 Today is the 64th anniversary of Burma’s independence. We are also just two months short of the 50th anniversary of the 1962 coup which set the country down the path to decades of dictatorial rule. It is a good time to take stock of recent events. Over the past year there have been many tantalising signals that things in Burma are getting better. On almost any criteria that we might choose there have been sustained positive developments. The biggest and most worrying exception, I’d suggest, is seen in some ethnic minority areas where, as Desmond Ball and I recently argued, “the balance that prevailed during the ceasefire years has finally broken.” If you want more details on that argument then pages 18-23 of the CSCAP Regional Security Outlook 2012 should do the trick. It is curious that at exactly the same moment that political developments in “Burman” Burma are being greeted with justifiable optimism there is fresh instability and violence in ethnic minority areas. I don’t have a straightforward way of explaining why this is the case. It remains a serious analytical challenge. Moreover, in 2012 crafting a new equilibrium in ethnic areas is surely the most pressing issue. It is also the one that, historically, and perhaps in perpetuity, looms over prospects for peace in the country. Even a President named Aung San Suu Kyi would likely struggle to knit together Burma’s many ethnic interests. So on this 64th anniversary we should give some extra attention to what the independent “union” really means. In 2012 how can Burma’s ethnic minorities more consistently see the benefits of the ongoing political transition? Can the multi-ethnic union be made to work for all? As long as the Burmans see the minorities as inferior there will continue to be strife. One of the many mysteries of predominantly-Buddhist Myanmar is why there is no peace movement to foster harmony among the indigenous groups as well as those whose ancestors from India and China settled in the country during the colonial period. It is curious that Aung San Suu Kyi made no mention of Myanmar with Indian and Chinese ancestors being included in the second Panglong conference that she proposed early last year. Little regards to “Myanmar history”, as represented well by your useless careless statement , and acting in a useless careless way is why Myanmar has become a quagmire. Burmans? The inhabitants originating from Myanmar. Do you mean to say Bamar (lu Myo)/Ethnic Burmese. Are you implying since the fall of Tathone (1057), this dominant entity, Bamar has regards other minority as less than equal? Implying Bamar as racist/discriminatory in their ruthless approach to dominating since 1057! justifiable as anti racist by you and your ilks is indeed glaring. Read ‘Burmeses Days’ by G. Owell and realized the behavior of this military regime originated from in all it repugnant ways and means. You keep referencing the past. Apparently you’re stuck there. Try looking to the present, and then to the future. Until the Burmese generals quit murdering minorities – and purposely killing civilians is murder – there will never be peace. In your previous posts you either ignore, or attempt to gloss over, the continuous war crimes perpetrated by the SPDC. Until that ends, and the generals end up in the dock, there will never be peace. Your unending defense of, and apologies for, the junta never ceases to amaze me. I’m of the opinion that the ‘Burman’ reforms and the conflicts are closely linked – it’s about consolidating political and business dominance, as are all the other ‘reform’ measures, regardless of whether they do or don’t benefit the population. The government would never orchestrate its own downfall, but engineer the landscape to ensure it retains its grip on power. Out-and-out dictatorial governance will never last, but a softer authoritarianism can (as is the case in Cambodia, which is now largely uncriticised by the int. community). I feel the ethnic wars are part of the means to shape a new Burma that allows investment to flood into the border regions – harder to do when they’re being resisted by armed groups – and therefore make it a market-friendly country (the key qualification for interaction with the govt, as business between the west and elsewhere – Saudi Arabia, Colombia, and so – shows). The political reforms are a move towards meeting the key benchmarks for ending sanctions, and the conflicts a means to ready the ground for post-sanctions investment. Securing these areas for exploitation is integral to the goals of both US/EU businesses, not to mention Asia’s hunger for Burma, and also serves to ensure longevity for the USDP. I don’t think people are really ‘getting’ the fact that these conflicts have evolved into ones driven by business. “déja vu”? Not even close. Give me ONE academic especially, in History, that support the west policy and I will show you the Charlatan. Your limited capacity to comprehend the tree for the forest or is it Crusoe’s ‘Not a Man Friday does not count’ attitude, make you, not an apologist but ‘The Running dog’ of the West. “Burman” suppression of non-Burman ethnic groups is likely to continue as long as the army controls policy. When 30-40% of a country’s population does not belong to the dominant ethnic group, the country faces the necessity of political accommodation. But the Burma army looks at the “minority issue” as a military problem, and seeks to impose a military solution (remember the old saying, “When your only tool is a hammer, every problem looks like a nail.”). An optimist can hope that the nascent “political reforms” might eventually lead to a recognition of the need to deal with the political issue of accommodation with the minority population using political, not military means. Until that happens, one can only hope that each incremental step toward openness is used to bring greater national and international scrutiny to the grotesque reality faced by millions of Burmese from the non-Burman ethnic groups. I very much doubt you intend to include the resulting scourge of the still ongoing useless careless policy, together with the well known military government solving “everything militarily”? Is 1 child out of every 5 in Myanmar will NEVER see their 5th birthday, proven statistic, grotesque enough. Be it Bamar or other ethnic groups. Democracy, Political Prisoner, Brutal suppression of unarmed protesters, did not doing enough to help the Nagis victims, Drug trafficking and now revamped minority suppression issues. 1)Precipitate negatively every conditions describe above if not cause 2)the creation of some new ones that wasn’t there b/f. Your wait and see “nascent political reform” of present maneuvering of military controlled transition absolutely contradict your “hammer to nail” view of the military. Plan B unfortunately is beyond the pale. Like Myanmar Patriots still fighting the colonialists whilst comfortably ensconced in Europe, he fulfills a similar role from Oz, both serving the interests of the regime and both manifesting the regime’s inherent now concealed hatred of ASSK. Now that the regime has changed tack and the Lady is in the bag, they find themselves in a bit of an awkward position. Still it doesn’t stop plan B banging on about the ‘useless careless west’. Chip Chasterton nailed it on the head.That’s the wood plan B and many others won’t see for the trees. If the regime thinks they can militarily subjugate the minorities and develop trade and industry over their mass graves, thay’ve got another think coming. ASSK dropped the idea of second Panglong when she obviously feared it would amount to confrontation. Was the Lady ever for confrontation? She certainly is for a U turn. She finally chose cooperation which most of us except the politically naive and ever-optimistic idealists see as collaboration. Roland Watson’s DICTATOR WATCH TEN YEAR REVIEW, October 17, 2011, shows us a way, but recent ‘reconciliation’ at the top between the regime and ASSK/NLD, aided and abetted by the US/EU, does not bode well unless the West completely out of character gives priority to peace and genuine reconciliation over market/business objectives. The future is none too bright since it is dependent on the leopard species of the regime and the West changing their spots. Given your ever lack of insight beyond ‘siempre revolucion’ I will willingly wear the Dunce Cap that you have ignorantly assigned to the Australian government as well. As a Bamar, when will your concern for humanity overcome your hatred for the generals? Big deal, plan B. Just dropping a few names from the list. Nothing personal, we just need to be rid of them. No institutionalised military rule. So the vultures are swooping down to join in the feeding frenzy with the hyenas. William Hague at least is playing hard to get but not for long. Rejoice and get over your hatred for ASSK.